Founders Crown Ambassador William “Bill” Britt has passed away at the age of 81. Britt, the founder and leader of Britt WorldWide, was one of the most successful yet controversial distributors in Amway’s history. 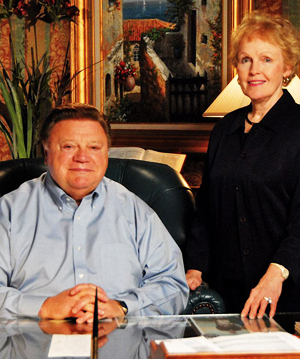 Bill and his wife Peggy joined Amway in 1970, ten years after the company began, and built one of the largest Amway businesses in the world. They reached Diamond level in 1973 and Crown Ambassador in 1996. In 2004 they were recognized as Founders Crown Ambassador, FAA 40, one of only 14 Amway distributorships in the world to have reached that level. The Britts are downline of Founders Crown Ambassador Dexter Yager, and were an integral part of the success and expansion of the “Yager System” in the 70s and 80s. The Britt’s eventually founded their own business support company, Britt WorldWide, which grew around the world, reaching great success particularly in India, where the Britt’s developed a second large Amway business, reaching Crown in 2009. Their success was not without controversy however. Britt’s firebrand approach, with no apologies for mixing his strong evangelical Christian faith, political beliefs and business attracting devotion from many but criticism from others. In 2004 the Britt organisation was the focus of a Dateline NBC investigation into Quixtar (now Amway North America) and several of his downline distributors were disciplined by Amway as a result. The Britt’s Amway legacy lives on, with hundreds of Diamonds from around the world in their downline, including Paul & Leslie Miller and Larry & Pam Winters from the United States, India’s Founders Triple Diamonds, Harbhajan Singh & Mohinder Braich and Double Diamonds Kanti & Lata Gala, China’s Founders Crown Ambassador’s Guo-Yuan Du & Ya-Qin Zhu (Matthew Du), England’s Double Diamonds Trevor & Jackie Lowe and Turkey’s Double Diamonds Hatice Firat & Mehmet Muratoglu and Merih & Nilufer Bolukbasi. Our thoughts are with his wife Peggy and the entire Britt Worldwide family. Previous PostMissing: Amway victims – if found please report to Boies, Schiller & FlexnerNext PostWhat do Jennifer Lopez, Kaoru Nakajima, Doug DeVos, and Bill Clinton have in common? I also met Bill many times while an Amway distributor. My time in his organization spanned about 36 years. We were not very successful in building the business, but that was on us not Bill’s organization. We were way down in his organization. Great man. Bill Britt was just your typical Southern scam artist. Bill Britt was not a “Southern scam artist” as you put it. All his earnings were legal, & most were transparent to anyone who had eyes. I did not know Bill had passed away. My wife and I were active in the business in the mid-late 90’s, and my wife was saved at the Richmond Coliseum on January 7, 1996 during a Sunday morning service Bill was conducting. That was the weekend of a huge snowfall, but the reduced turnout made the experience that much more intimate. I hope Peggy and their family are doing well. God Bless you, Bill. R.I.P. Fate whispered to the Warrior “You can’t withstand the storm”. Bill Britt touched my life beyond measure may he rest in Peace. Amway is utter cack, and Bill Britt was scum. I’m glad he’s dead. He helped scam millions of people & ruined countless lives. May his corpse be shat upon, & his legacy burn to the ground. a tad nasty . None of those things will happen to his corpse as there is no after life. He will just rot as we all do. Ive met Bill a few times in England and he was always nice enough to me. I guess opinions vary. Wow. Did you ever meet Bill Britt? I did. He was nothing you have posted. I think you don’t know what you are talking about. Bill britt was nothing but a super successful individual. Your jealous because you didn’t have the skill, knowledge or work ethic to make it in MLM! I just want to join Amway organization with many doubts and quotions. Is any hope to comfort the life further or it’s just a products selling methods, where top 10 person enjoy their life and rest of other struggle life time. If it is a business like this, I just want to know from you…..
As far as i know, this business works. Earlier i had a notion that there’s no income in this business. But, when i started building the business with the help of my friend and started earning myself, my belief in this business became more stronger. But, as like any other business or in any job we work have to work hard here too. The difference is that, we create an asset here. So, we should not enter into the business with a job mindset. I also was blessed by Bill in my life while an Amway distributor. I had the privilege of spending time at Bill and Peggys home with two other fellow distributors in Chapel Hill, NC. We were there attending one of the two Britt schools I attended. He was a great man of God. I was down line of the great John and Jeannie Bell Crowe. All and Mari Brecciani Spencer Rick and Rhonda Borland. John and JB are doing well! I was saved (Born Again) at a F.E.D in Philadelphia during a Sunday Morning Service (Aug 22, 1998 I believe was the date). I enjoyed my time with Amway/Quixtar, however I redirected my line of work. Bill was an interesting, no nonsense kind of guy. I was blessed to be involved with Amway under the Britt Organization. He will be missed by many. I was also saved at a F.E.D. in Portland, OR in 1981 after hearing the gospel at the service Sunday morning. I enjoyed listening to Bill’s no nonsense teachings on business and life. He had a positive impact on tens of thousands during is life. “FREEDOM ISN’T FREE AND YOU CAN’T HAVE PERSONAL FREEDOM WITHOUT ECONOMIC FREEDOM, AND YOU CAN’T HAVE ECONOMIC FREEDOM WITHOUT PERSONAL FREEDOM! As a passed downline. I was blessed by Bill and Peggy at every function.Gave my life to Jesus at Rex Renfro’s Sunday morning church service at Spring conference.I look forward to seeing Bill again. A Great Man.Praise the Lord!!! Bill Britt reminded me of my dad (who has also passed away) whom I loved and honored. There was no gray area with either; you always knew where Bill Britt stood. He was a true patriot and a man with incredible character. As with my dad, I attribute the way I think to Bill Britt. My prayers to the Lord for Peggy Britt and her family. So sorry to just now hear of Bill’s death. My thoughts and prayers are with Peggy and their family and loved ones. I’ve watched him speak several times at functions and even though I’d never met him I liked him a lot he seemed to me a mans man. My wife and I have great memories of those times. I learned a great habit that I have still today from Britt Worlwide, and that’s reading. 🙏🏾 I’m grateful to have been in his presence and to have learned so much about business. But, most importantly I learned about myself. Live on Bill.